Be among the first to tour the Alexa at Windust Meadows! CAMAS, Wash., Jan. 23, 2019 /PRNewswire/ -- Richmond American Homes of Oregon, Inc. (CCB #218193), a subsidiary of M.D.C. Holdings, Inc. (NYSE: MDC), is pleased to debut its inspired Alexa model home at Windust Meadows in Camas. The two-story home, which boasts approximately 2,980 generous square feet, is the builder's third model home in the Greater Portland area. 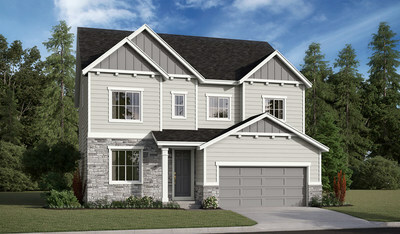 Prospective homebuyers and area agents are invited to attend the Model Home Grand Opening (RichmondAmerican.com/events/1385) at Windust Meadows on Saturday, January 26, from 10 a.m. to 2 p.m. Guests will enjoy complimentary lunch as they tour the 4- to 5-bedroom Alexa model and learn everything the charming new community, set amid the tall pines and rolling hills, has to offer. 4 to 6 bedrooms, approx. 2,560 to 3,000 sq. ft. Ask a sales associate about special offers at this notable new neighborhood. Windust Meadows is located at 1314 NE 39th Court in Camas. Call 800.439.1405 or visit RichmondAmerican.com for more information about this exciting new community.